I spent a good part of last Sunday’s 75th anniversary of the Golden Gate Bridge on the Tiburon deck of friends Wiebke and Uwe. They have a panoramic view of the San Francisco Bay, Angel Island State Park, and the Golden Gate Bridge. 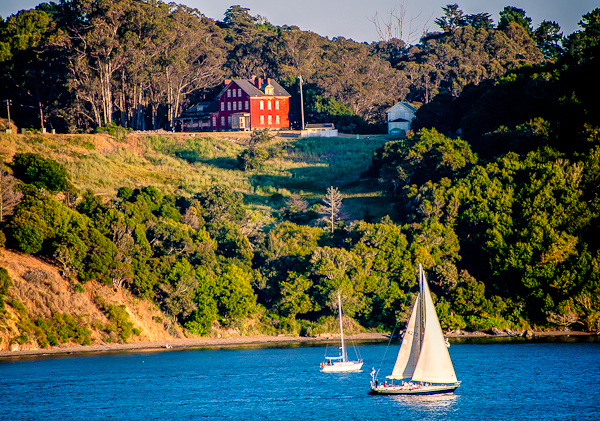 The red building you see on Angel Island is the Camp Reynolds 12-bed Army Hospital built in 1905 and abandoned in 1946. There was a moment when I thought the vodka blimp was going to bump me off the deck. I wasn’t even drinking. 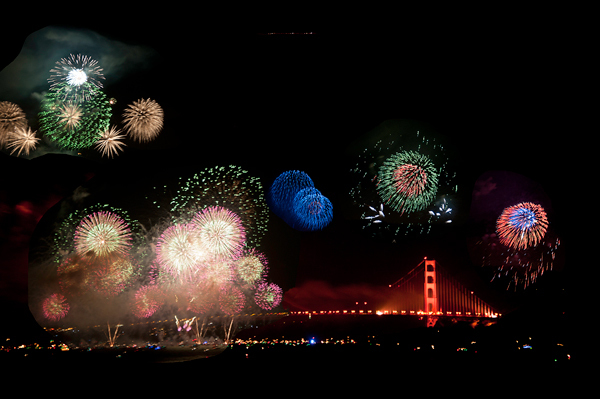 Uwe asked me to take a photo of the fireworks on the Golden Gate Bridge, maybe to send to his friends in Germany. I can’t blame him if he wants to brag a little about his view. This is a composite of some of the best bursts. This is a photo I took in 2010 when I was experimenting with High Dynamic Range photography. 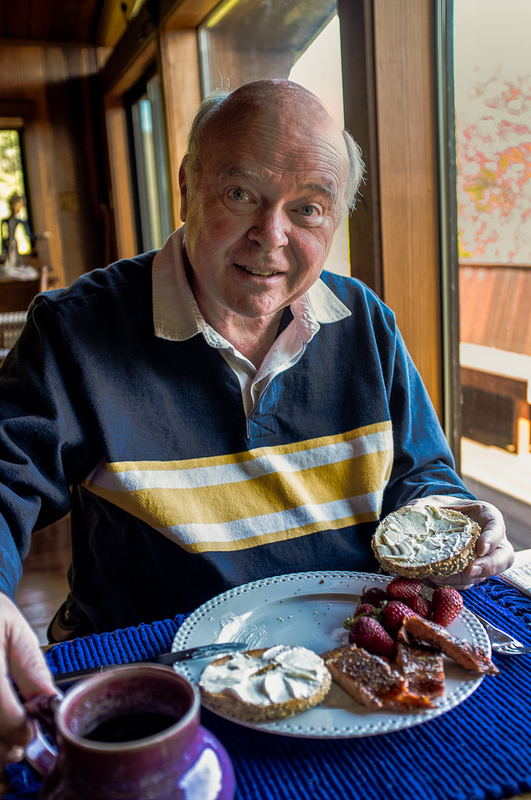 Approaching Memorial Day, I thought this would be a good time to put it on the blog. San Francisco National Cemetery in the Presidio. Originally a Spanish fort, the first settlement was built by Mexican families in 1776. During the Mexican – American War of 1846, U.S. Troops occupied the area and declared it U.S. territory. 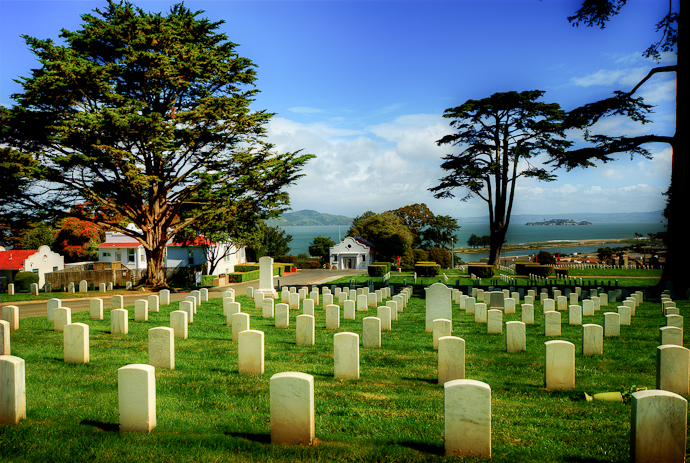 In 1884, the War Department set aside nine acres of this once Spanish garrison (Presidio) as a national cemetery. It’s located in the northern section of the city, overlooking the San Francisco Bay. Wikipedia lists 35 Medal of Honor Recipients buried in the Presidio. Before last week I’d never heard of the Nuba Mountains. It’s a distinction I probably share with most of you. Who can keep up with the killing fields around the world? It’s exhausting, don’t you agree? Naively, I once thought that after the Holocaust, the world would never again allow the mass killings of innocent civilians. How wrong I was. Syria has grabbed the headlines recently, but in a quick internet search I found massive civilian murders being carried out right now in Central African Republic, Sudan, Democratic Republic of Congo, Eastern Burma, Eastern Chad, Iraq, Somalia, and Sri Lanka. I’m probably missing a few. What can I do? Sign a petition? Write a letter? Make a donation? Vote for someone making vague promises? At times it all seems hopeless. It’s so much easier to deny the enormity of it all than to deal with one’s impotence. I’m thinking of all this just now because of two people I recently met who refuse to give up hope. They’re working ceaselessly to stop the indiscriminate killing and injury of civilians around the world. 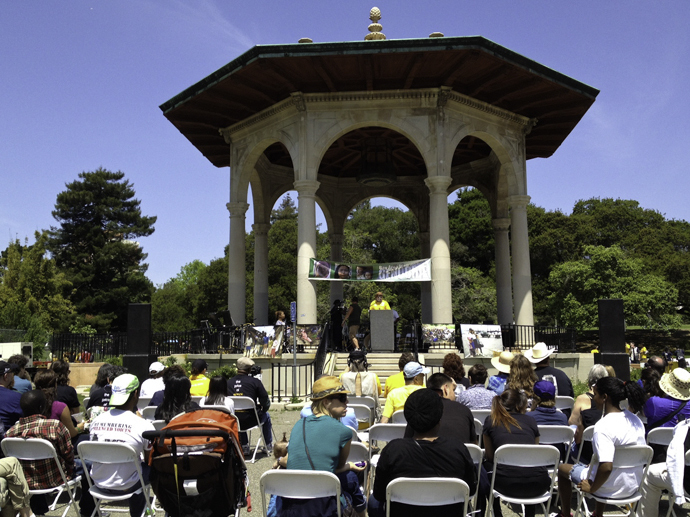 I was introduced to Yassir Kori and Gregory Stanton by friend Gayle Donsky, who helped organize the second annual Bay Area Walk Against Genocide. The April event was organized to increase public awareness of current genocides, and Yassir and Gregory were features speakers. I had the chance to spend a little time with these men and learn something about current efforts to stop genocide, and especially about what is happening to the women and children of the Nuba Mountains, located in the central part of southwestern Sudan. Yassir A. Kori, Founder and Executive Director of Nuba Vision Coalition. Yassir A. Kori is a native of the Nuba Mountains who was forced to flee because of his Christian beliefs. He sought asylum in the United States and is now a citizen, living in Oklahoma City and working on his Ph.D. He plans to eventually return to the Sudan and lead his country toward a U.S. style democracy. 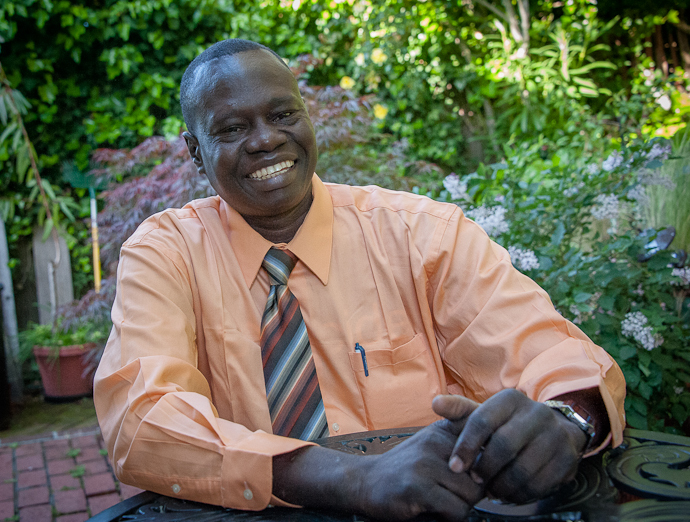 Yassir is the executive director of the Nuba Vision Coalition. 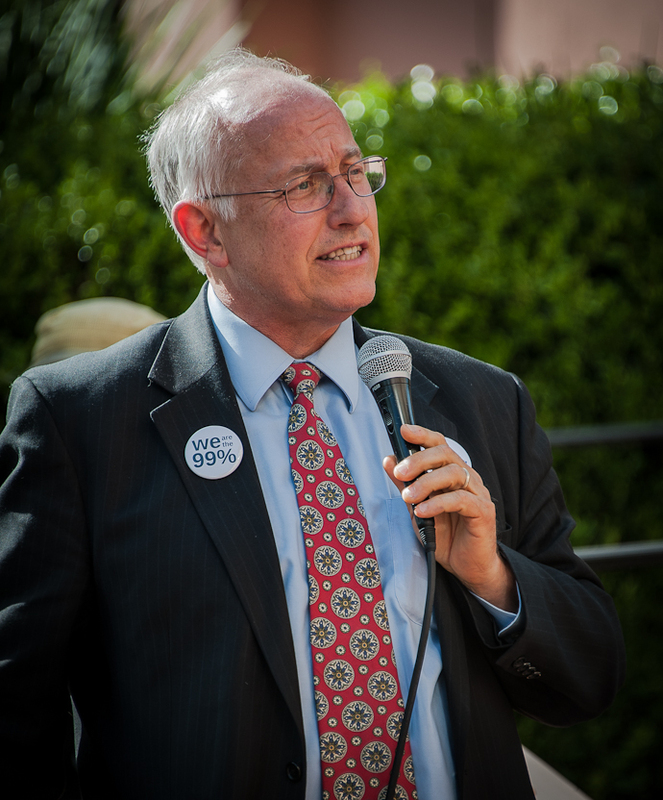 Gregory H. Stanton is the Founder and President of Genocide Watch. Gregory H. Stanton is president of Genocide Watch and Research Professor in Genocide Studies and Prevention at George Mason University in Virginia. He has spent much of his career studying genocide in many regions of the world and working to end the systematic and deliberate killings of massive numbers of innocent civilians. Yassir Kori points to a map of the Nuba Mountains on Gayle Donsky’s computer screen. What I learned from Yassir and Gregory is that while the geopolitics of the region may be complicated, the facts on the ground are not. Innocent civilians are being bombed daily by the Sudanese military controlled by President Omar al-Bashir. Food supplies are cut off and people are being deliberately starved. al-Bashir says that he is putting down an insurgency, but both men agree that what is really going on is a blatant attempt to drive black Africans from oil rich lands. The International Criminal Court apparently agrees. It has issued an arrest warrant for al-Bashir, accusing him of genocide and crimes against humanity. I’m grateful for people like Yassir, Gregory and Gayle for refusing to give up or tune out. May Day came and went peacefully in Marin County. 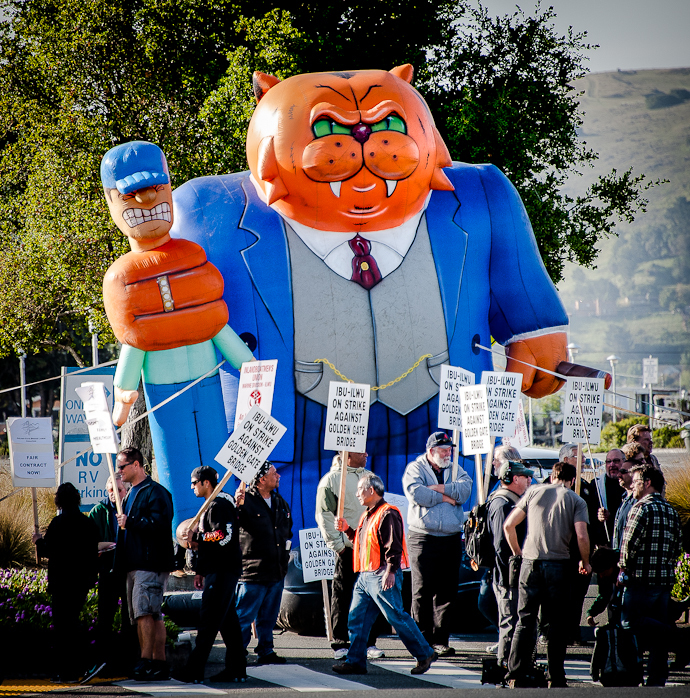 We did see a gigantic Fat Cat at the Larkspur Ferry Terminal , and peaceful protesters of all persuasions in the San Rafael City Plaza, but nothing like the excitement generated by the thousands of protesters in nearby Oakland and San Francisco. As usual, violence monopolized the headlines and generated the largest photos. It’s amazing how a handful of violent people can focus our attention. Sometimes it seems like it takes many thousands of peaceful protesters to make a ripple. 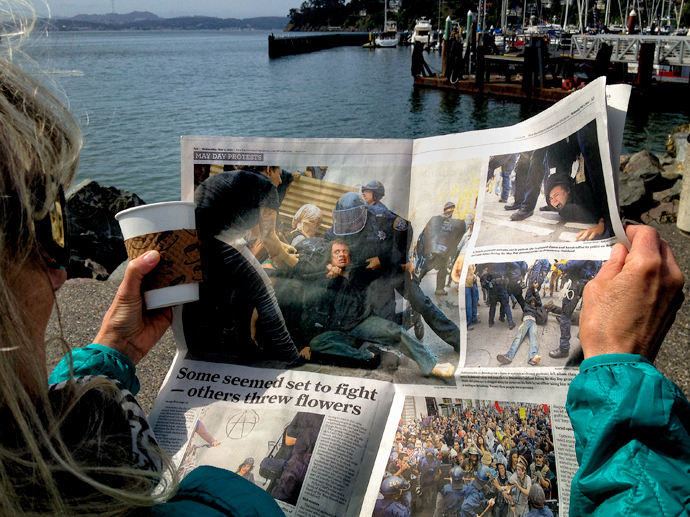 Rica relaxing on the Tiburon waterfront while reading about Oakland May Day protests. More that 100 union protesters blocked the entrance of the Larkspur Ferry Terminal, shutting down the morning ferry commute to San Francisco. 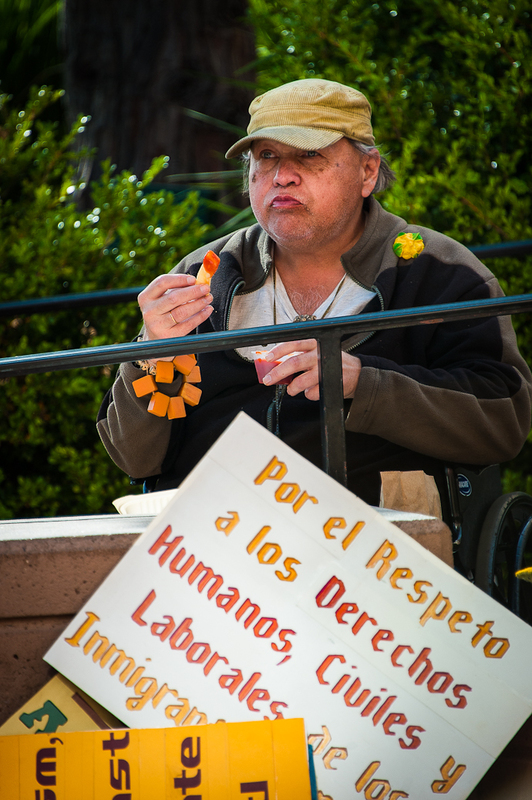 Protesters from many backgrounds gathered to listen to speakers at the City Plaza in San Rafael California.